Leading off today: Joe Girard III scored 43 points and Trent Girard had a career high 21 as Glens Falls edged Cardinal O'Hara 88-79 in the Federation boys Class B basketball championship game on Sunday. Trent Girard went 5-for-6 on three-pointers in his final high school appearance. Joe Girard ended his career with 4,763 points and 102 varsity wins. Playing before a packed Cool Insuring Arena crowd for the second straight day, Glens Falls led 44-29 at the half and by 18 in the third quarter. But O'Hara closed to within 77-74 on a Jermaine Haynes Jr. layup with 1:45 to play before Trent Girard came off a screen and buried a straight-on 3-pointer. "I love that kid," Joe Girard said. "He is as tough as nails and does whatever it takes to win. I've been with him my whole life. He's been in the gym with me a lot and that was our last moment together on the court and in an Indians uniform in general." O'Hara held a 46-33 advantage in rebounds but shot just 5-for-28 on 3-pointers and 16-for-28 at the free-throw line. The Hawks were led by 26 points and 18 rebounds from senior Justin Hemphill. Irvington ... again: The Irvington girls captured their fifth Federation title, hanging on late to hold off Brooklyn Law & Technology 47-41 in Class B. The Bulldogs led by 15 through three quarters but saw the margin cut to just two points with less than a minute left. Irvington junior Abby Conklin (12 points) then made four free throws in the final 34 seconds to complete the win. "It was a very aggressive game and a very physical game that was maybe more physical than some of the other games we've played," Irvington coach Gina Maher said. "We wanted to show poise with that, and I think we did a good job." Sophomore Grace Thybulle recorded a double-double with 12 points and 14 rebounds. Senior Mia Mascone finished with 15 points and six rebounds. Irvington finished its season 29-1 with a lineup that had to be remade after the graduation of four starters last June. "I think there was a lot of pressure on them -- more pressure than people realize -- and they handled it really well," Maher said. "They're going to be successful in life because of that, and that's really what this is about: The game of basketball becomes the game of life." Albany Academy rolls: Ivy league recruit August Mahoney went 8-for-12 on 3-pointers to account for 24 points as Albany Academy rolled past Frederick Douglass Academy 75-49 in the boys Class A championship game in Glens Falls. "When he finds that groove and he gets those hands ready and those feet moving, usually he finds the bottom of the net," coach Brian Fruscio said of the 6-foot-4 guard. "In his four years here, he's not just a shooter, he's a player, and Yale should be really, really happy to be getting him for the next four years." Albany Academy went on a 44-13 blitz in the first half on the strength of six Mahoney 3-pointers, including successful attempts on three straight possessions as the Cadets broke to an 11-0 lead. "They came out and had an unbelievable first quarter and a ton of energy, and that started the day off the right way," Fruscio said. Coach steps down: One of the state's high-profile boys basketball teams will have a new coach next season following the news that Sal Constantino has stepped down at Niagara Falls after nine seasons. Constantino admitted he was worn down by seemingly non-stop criticism from basketball fanatics in the community. "I've been out in public with my son and they've just walked up to me and (cursed at) me with my son there," Constantino said. "The thing with people now ... there's no filters. That's worn me down. We're trying to do best by the kids." Constantino compiled a 139-54 record with five Section 6 Class AA championships, including the last four in a row. 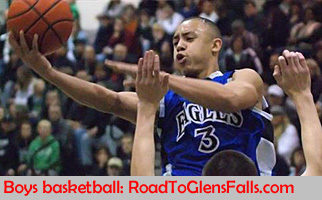 This season ended with a 59-57 loss to eventual champion West Genesee in a New York Public High Schools Athletic Association Class AA semifinal. "He's everything that's right about Section 6 hoops," Niagara-Wheatfield coach and Niagara Frontier League chairman Erik O'Bryan said. "He was always about the players first and not worried about himself. ... He is going to be missed."